Scarcity of jobs for high school graduates is a huge problem in Guatemala, especially in small pueblos like San Antonio. Less than a year ago, our little group of Vancouver Island volunteers, along with Candelaria and Gregorio – the creative and capable couple overseeing the programs at the Casita – brainstormed this issue. The result? A course for recent grads and other youth, to help them with the skills they needed to find a job. The course was originally intended to last 3 months, but it achieved a momentum of its own and just kept on going. The group decided that, with the lack of hiring infrastructure in San Antonio, the best way to find jobs was to create them. 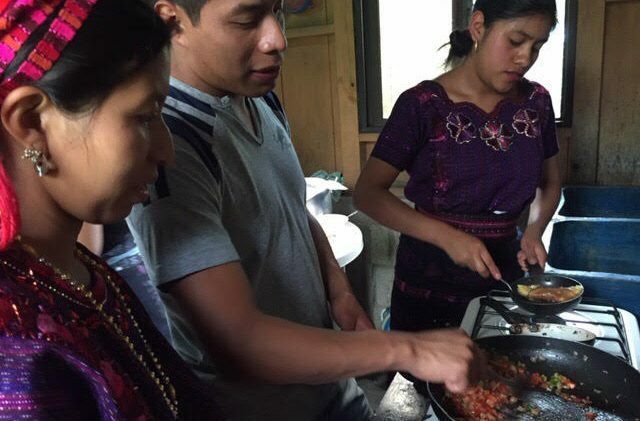 Enter MAGA, an outreach program of the Guatemalan government, invited in by Candelaria to help the group. MAGA offered to train the group in the raising of oyster mushrooms, and to guarantee them markets for their product. The Casita toolshed has now been converted into a mushroom shed, and ICO has paid for materials for a 2nd small shed, now being constructed by the youth themselves (with a few tips from Gregorio). But the long-term vision of the group is to start a café – something currently missing in San Antonio – entirely run by youth. They have researched it, are in the process of designing a business plan and finding a location. MAGA is now training them in the cooking skills and business skills they’ll need for this venture. We’re all feeling pretty excited that this group of 15 highly-motivated young people (18-25) are finding their feet in the world of business, and becoming leaders in developing their community. None of this could happen without the generous support of our donors. ¡Gracias!